Amazon Price: $6.40 (as of April 26, 2019 7:49 am - Details). Product prices and availability are accurate as of the date/time indicated and are subject to change. Any price and availability information displayed on the Amazon site at the time of purchase will apply to the purchase of this product. 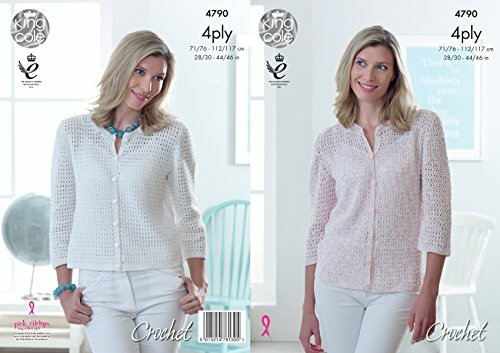 This 4ply crochet pattern leaflet 4790 by King Cole will instruct you on how to create a ladies long or short sleeved cardigan with three quarter length sleeves. The pattern gives you instructions to create the garments suitable for a bust size of 71cm – 117cm (28" – 46") approximately. This King Cole crochet pattern is suitable for use with most 4ply yarns, however tensions may vary and we recommend you crochet a tension square before making the whole garment. See image provided for the number of 50g balls of yarn required for each garment and the colours that are illustrated in the leaflet. 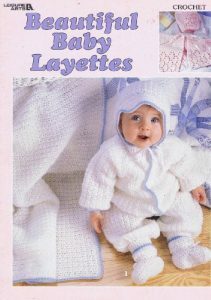 Please note that this is a crochet pattern and NOT a set of finished garments. All instructions are written in English. The yarn illustrated is Giza Sorbet 4ply and Giza Cotton 4ply. We have a variety of yarns available to purchase on separate listings. This is a King Cole ladies crochet pattern that instructs you how to create a long or short length cardigan, using Giza Sorbet & Giza Cotton 4ply yarn. Measurements:28" – 46" (71cm – 117cm) Bust. Needle Size:1 x 3mm (UK 10 – USA D/3) & 1 x 3.5mm (UK 9 – USA E/4) Crochet Hook. Shade Illustrated:King Cole Giza Cotton 4ply in White – Shade 2190 & Giza Sorbet 4ply in Strawberryade – Shade 2470. Please note that this is a crochet pattern, NOT a set of finished garments.